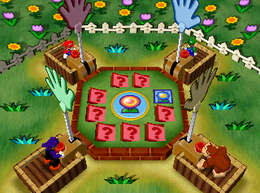 Slap Down is a battle minigame found in Mario Party 3. It appears to be somewhat based on the real-world game slapjack. The minigame takes place inside a flower garden. There are several flowers growing on the field, with a wooden fence surrounding the area. In the middle of the screen is a game table with nine panels and a flower image in the center. The minigame sets in with four of the characters standing around the table next to a red button on a device linked with colored mechanical hand. At the center of the table, the flower icon continuously changes until it stops a short time later. Then the minigame starts. The players' objective during the minigame is to slap down their mechanical hands by pressing the red button the fastest as soon as the rotating panels show an image that matches the flower in the center of the table. There are five different flowers in the minigame; only one randomly selected on the middle of the table before the minigame starts. If a player slaps their hand on the flower on the center while the flower icons do not match, they will be disqualified and cannot continue playing the minigame. If three players slap down at the wrong time, the remaining player wins by default. If all four players slap down at the wrong time or no one slaps down when the correct flower is shown, the minigame will end in a draw. Unlike other minigames, the item minigame-loss music plays instead of the traditional draw music. Rules – "Quickly press A when the flower on a revolving panel matches the big flower in the middle!" Advice – "If you slap on the wrong flower, you'll be disqualified. Make sure the flowers match!" This page was last edited on March 10, 2019, at 17:44.